Swacch Bharath Abhiyan | Ramakrishna Math & Mission, Mangaluru. 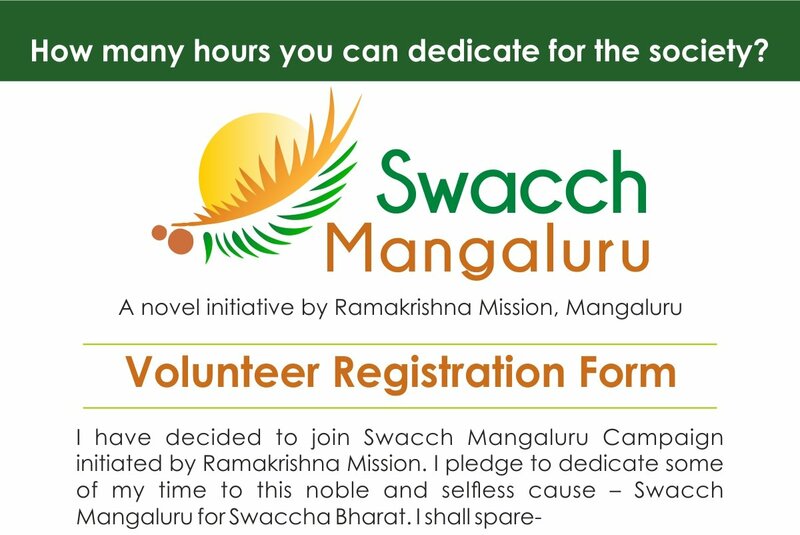 Ramakrishna Mission, Mangaluru is launching 4th phase of the Swacchata Abhiyan on 3rd November. Honorable Union Minister of State for Drinking Water & Sanitation, Sri Ramesh Kumar Jigajinagi will be inaugurating the programme at 9.00 am. Ramakrishna Mission, Mangalore has organized Residential youth camp for rural youth between age group 17-30 from 24th to 27th December. The participating youths have to register their names beforehand by paying a nominal entry fee of Rs. 100/- and fill up the registration form before 15th December 2015. The medium will be Kannada. Participating delegates will be addressed by various resource persons on several issues pertaining to youths on topics like national regeneration, personality development, values etc. Registration forms can be had from Ashrama office. For more details, interested can contact Ashrama office at 0824-2414412 from 9 am to 12 noon and from 3.30 pm to 6 pm. 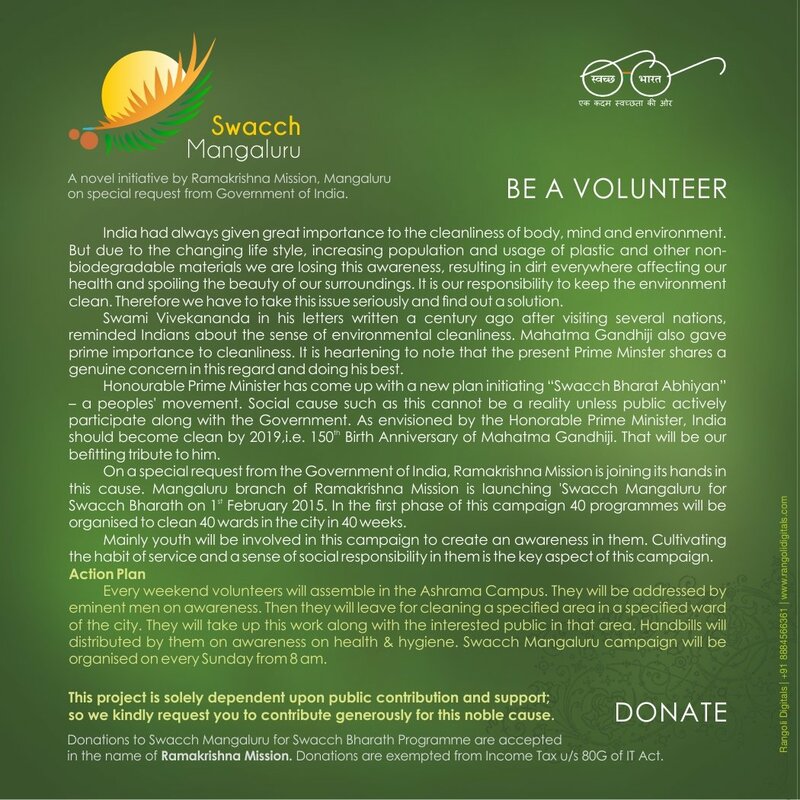 Ramakrishna Math Mangaluru is organanising a massive cleanliness drive – ‘Swacch Mangaluru for Swacch Bharath’. In a nutshell it is 40 cleanliness programmes in 40 wards of Mnagaluru in 40 weeks. ‘Swacch Mangaluru for Swacch Bharath’ was launched on 1st February 2015 in a grand function at Ashrama Campus. We request student, public and all people who have dream of clean India to be part of this Mission. Selected area of Mangaluru will be cleaned every Sunday morning for 3 hrs. Be a Volunteer in this weekly event and create a clean India. Every week Volunteers are supposed to assemble at Ramakrishna Math Campus, Mangaladevi, Mangaluru at 7 am. Arrangements will made to drop them at specified places.